Forget your Crock-Pot, the bright-colored mini-rice cooker is your new easy-to-use, easy-to-cook solution for everything from eggs to pad thai to chocolate cake. Looking for a fast dinner, dessert, or a tasty snack, the Mini Rice Cooker Cookbook has something for you. The perfect complement to your new appliance, the Mini Rice Cooker Cookbook has fresh ideas for every occasion, from breakfast to dessert. A mini-rice cooker is perfect for cramped college dorms, small apartments, even RVs. You don’t need extra kitchen tools like pots and pans for these recipes. 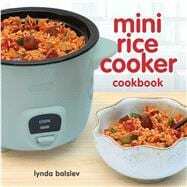 Offering vegetarian, vegan, or gluten-free variations, the 20 recipes in this mini cookbook are sure to stretch your imagination for what a rice cooker can do. Recipes include pasta, soup, stew, beans, grains, cakes, breads, and more. Lynda Balslev is an award winning writer, cookbook author, and recipe developer. A New England native, Lynda attended Le Cordon Bleu Ecole de Cuisine in Paris and remained in Europe for 15 years, working as a food editor, culinary instructor, and personal chef in Switzerland and Denmark. Lynda currently lives in Northern California where she continues to cook, teach and write about food and travel.